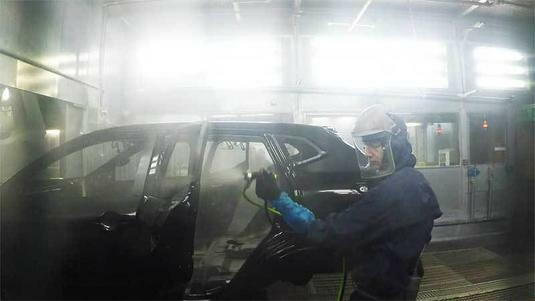 NISSAN UK has been using SAMES KREMLIN FPro Lock airspray spray gun and comments about the great results they were able to achieve in terms of finishing spraying quality and cost savings. NISSAN Sunderland invested in SAMES KREMLIN new innovative airpsray spraying technology to meet its high level productivity policy! 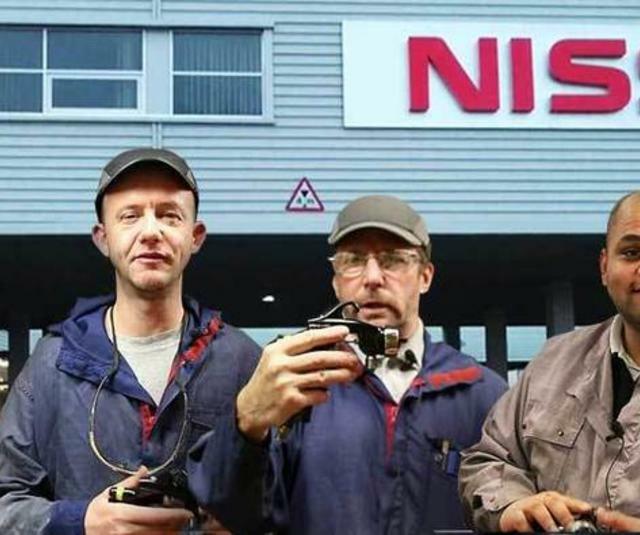 The Sunderland Nissan site is one of the five most productive industrial finishing factories in the world and the first in Europe. For a decade, it has been setting records. Behind this performance, three key words: Organization, rigor, technological progress ... To be competitive in the automotive industry, nothing but succeed in controlling its production costs. Over £10m has been invested into the Paint Shop, in readiness for the upcoming introduction of new models. SAMES KREMLIN is part of this challenge: the Fpro Lock spray guns have been installed and have got a great success in the 'Topcoat' Booth, where the body receives its final coats of paint - Topcoat and Clearcoat layers. The FPro Lock paint spray guns are used for painting areas between doors and chassis for cars: As of today, very positive results have been done (especially on ergonomics), the finish spray quality is judged far better than it used to be and a product savings of up to 40cc par vehicule has been achieved, which on the basis of 1/2 million vehicles produced per year means a lot! Quality and productivity are the main assets: after being stoved in the Topcoat oven, the body then enters the 'Touch-up' Booth where the body has its final inspection for any imperfections picked up in the Topcoat process. Once the body leaves here, it then moves on to the PBS (Painted Body Store) above Trim and Chassis to await the next step in the production process. We've seen a paint saving of 40cc per car, and it is a big amount per year! Himanshu, process engineer in the Sunderland paint shop, comments: we have been using the FPro Lock SAMES KREMLIN airspray spray gun for quite some time now. The good aspect with this paint spray gun is that the atomization is really good and actually, we have seen about 40 cc of pain savings per car which is quite good actually for us because we build about half a million cars every year so that accounts to be a big amount! also it's quite lightweight, very ergonomic to use. We've also got some air savings with it because normally we run at a higher pressure but with this spray gun, we are able to reduce the pressure by half so we have seen quite a few air savings and it's a good looking airspray gun. With The FPro Lock spray gun, I'm about a paint saving of 20% on our current guns! A year ago, we have been trying the FPro Lock spray gun from SAMES KREMLIN, it's a light paint gun very ergonomically designed to hold in the hand, the Lock version also got features where it's locked off, so there will be no adjustment made on the front button, no air pressure adjustment, no needle adjustment. We founded it as a good paint spray gun because it gives us to same flowrate every single time, when we paint with it. We installed in December 27 day. I'm about a saving of 20% on our current guns. The painter life is good with this spray gun because of the lightness, because of the ergonomics design to hold and because of the savings in the paint. The maintenance on this paint gun is quite easy because it's got no moving parts as in terms of the fan pattern changes or the air changing, we only have two things to do which is to check that the quality of the air cup is OK and the quality of the fluid tip is OK. Once these things are done, the maintenance is quite easy, very little maintenance! The FPro Lock Spray gun is a lot better than the previous guns I have been using! It’s the first time I’ve used the FPro Lock spray gun today. I thought it was a lot better than the other one. A lot better than the paint guns we have been using. It atomizes very well. You don’t need to put as much paint on. It seems to be a lot lighter in your hand, so far, very good ! You’re not feeling as much pressure on your arm as you’re using it!